This sweet, spicy, and salty fruit salad is a wonderful way to hydrate after an intense workout. The sugar and the salt come together for a great snack after a session at the gym, since the electrolytes help your body to absorb the water in the fruits more readily than just plain water alone. Don’t just think it’s a dish for those who sweat it out since you can also serve it as a perfect summer fruit salad at your next barbecue or showcase it as a winter fruit salad during the holiday season. Bring it to a potluck or work it into your weekly meal plan as a wonderful addition to your lunch box. There are a lot of different fruits you can use, but the addition of some crunchy, juicy vegetables can’t be replaced. 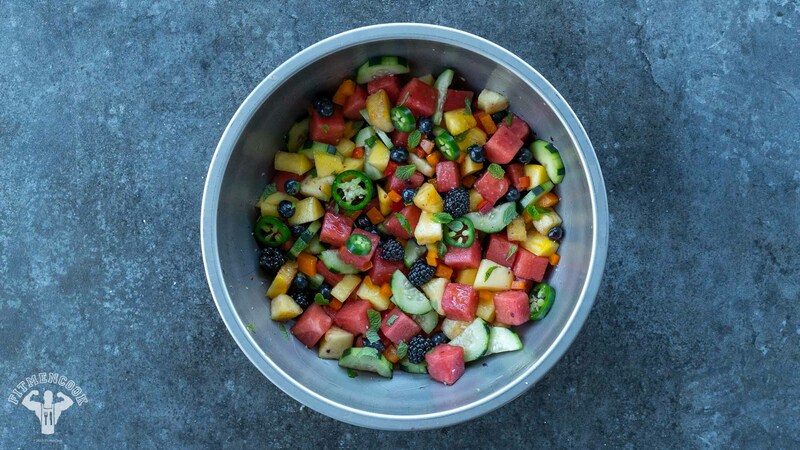 The cucumbers, red bell peppers, and jalapenos add a savory undertone to this refreshing fruit salad. We chose fresh pineapple, mango, watermelon, blueberries, and blackberries for a colorful mix, but you can add mandarin oranges, strawberries, raspberries, or apples for a twist. The jalapeno adds a kick of heat, while the mint washes over with a cool and refreshing flavor. The lime juice (although you can sub it out for lemon juice) will help keep the fruits from browning, and a little bit of honey pulls all the flavors together. If you want to take the salad dressing to the next level, add some poppy seeds for some extra flavor since it goes great with honey and lime. Serve this delicious fruit salad with something creamy, like vanilla pudding or fresh whipped cream. You can put it on top of some Greek yogurt for a quick and easy breakfast, or treat it like salsa with some herb roasted chicken breast. While you might find the peeling and dicing of some fruits tedious, you can throw any extra fruits and vegetables into the freezer to make smoothies for later. Did we mention that aside from being delicious, this recipe is also paleo? Instead of using corn starch to thicken the dressing, we used arrowroot which makes it both paleo and gluten-free. Do you like the way this sounds? If so then feel free to check out our recipe video which will guide you step by step in making this fresh fruit salad. If you are a slow cooker – don’t worry, preparation of this recipe won’t take long. When you try this recipe, please drop us a comment to let us know how you liked it! We would love to hear that you enjoyed it. Squeeze limes and oranges into a bowl and mix in honey. Set a nonstick skillet on medium heat and when hot, pour in the sauce. Bring it to a light simmer, then pour in the arrowroot starch mixed with water. Stir immediately so the sauce does not clump and remove from the heat to let it cool and thicken, about 6 to 8 minutes. Add all of the ingredients for the salad in a large bowl and mix everything together. Pour in the sauce/syrup and gently fold the fruits and veggies in the sauce.